A lot of choreography, some of it original & some of it from vintage clips. Emphasis on tricks/flash to get attention (The Camp Hollywood showmanship judging criteria may explain this). Bal-swing being dispersed through some couples turns out in the center (4:15 Tip West & Holly are. Even though there is a line up it almost seems like a jam circle format with the competitors being surrounded, something I don’t see that much these days besides some ULHS competitions. Tempos were a lot faster, my BPM counter clocked in that last song around 320ish. Bonus: Notice at 5:28 a certain drummer from a LA swing band that most of the United States can recognize out there. What I liked is they seemed to have a little of everything in this performance. An example of this is at 0:53 they go into a “fanny out” posture popularized by Ray Hirsch in some of his clips, but the interesting thing is while they are in it they don’t go wild and crazy like a lot of people do when they adopt this posture but instead keep it clean and controlled. At 1:52 they briefly go into single rhythm shag (quick, quick, slow) for breaks as well. In this clip we have Sailor Mike and Holly who were both in the 1999 Camp Hollywood shag division at the beginning of this post. Unlike the other two settings of a competition and a performance we get to see what Shag looked like danced socially in the early 2000s. While for most of the clip they are both pretty clean technique wise, toward the end when the drummer starts having fun, Mike and Holly start to as well. This is unlike the competition or the performance where if people were “crazy/wild” it was a reference to some vintage clip or pre-choreographed. Marcus Koch und Bärbl Kaufer dance in an instructor demo where there is Collegiate Shag mixed in with Balboa & Lindy Hop. What stands out to me is Marcus and Bärbl are very performance oriented and their presentation of their movement seems to be a key factor here. This clip is the instructor (and special guest) demo from Shag Jam 2007 in San Francisco. Depth is the first word that comes to mind when I see this clip, because compared to a lot of the early 2000 clips it seems like it is less of trying to get from move to move but more building upon previous movements to make more of a statement. A perfect example is at 0:36 where Sailor Mike is doing a double rhythm basic but it slowly builds up larger each time. As annoying as the guy frequently yelling “This is a battle.” is, he has a point. The battle format at Camp Hollywood showed how individuality and style was starting to become more prevalent and the pressure of a battle brought some interesting things out into the open. There are some who were staunch traditionalists and would only stay in double shag rhythm and dance crystal clean basics, there was some who would use tricks and choreography from vintage clips, and there was some that would go in their own directions. At this particular year during Shag Jam the finals were conducted by having the finalists dance with the instructors. It was a fun mix of the old school & new school, interestingly enough a lot of the old school material worked just fine with newer dancers. If you watch the first clip at 6:47 and this one at 1:37, you will see Minn Vo show that a trick still works fine 9 years later. This is a smaller competition in Los Angeles, California. It’s interesting to see many of the dancers who would go on to be prevalent in future Camp Hollywood Shag divisions when they were a bit more green, also its rare to see a female lead in a Shag competition as well. This year at Camp Hollywood had competition from all over ranging from Germany to New York City. At 3:14 check out both of the couples battling coincidentally both pull tricks out of the Ray Hirsch book at the same time. At Rock That Swing Jeremy Otth and Laura Keat performed in Munich. I can confidentially say this is the most polished Collegiate Shag performance I have seen in all of my scouring of clips through the internet. Oddly enough the reason why this is in here is Sailor Mike’s exit. Unfortunately the entrance where he was brought on the dance floor in a coffin is not on film, but this was probably the hands down craziest competition entrance and exit of all time and earned him and Tip West the coveted Golden Bugie award that year. Besides Tony/Jamie & Joe/Tabitha, not too much flash or tricks was thrown in this competition compared to Camp Hollywood. Interestingly enough a lot of the competitors from Camp Hollywood are not present as well. Thing to note is the change from a battle format to spotlights for each couple. Something I would like to point out as well is I noticed a lot toward the mid to late 2000s a shift toward better technique/improved musicality/complex movement but it seemed to be missing something. What that thing was I believe is the borderline manic energy some of the competitors had on their faces and in their movements at the 1999 Camp Hollywood finals. I think what Stephen and Fancy had going for them, was the fact that they had that in this particular competition in addition to good technique. 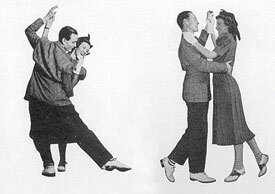 The interesting struggle I notice now in the Collegiate Shag community is how to expand our repertoire of movements without losing the aesthetic of the dance, whether that be borrowing from Balboa/Lindy Hop or other dances. In addition the idea of sticking with double rhythm which is a very traditionalist view or expanding to “multrhythms” (Note: Formerly listed as “poly-rhythms”, see Ryan M’s comment below for clarification). What I’ve seen in the last 10 years through my little clip scouring adventure is the assimilation and integration of vintage material and adding an individual touch to it. In the mid 2000’s I noticed people not just exactly copying Ray Hirsch’s material but slightly modifying it or creating their own entrances/exits out of it. I’ve also seen a considerable increase among the top level dancers of their ability to remain smooth regardless of tempos are complexity of movements. Even though I spent a decent amount of time on this, I still feel it is a rushed assessment. Do any of you guys have thoughts on how the Shag community has evolved or is evolving? This entry was posted on October 30, 2011 by Apache. It was filed under Collegiate Shag, Dance . Hey there! This is a fantastic article. What a great retrospective! Shag really seems to be getting more attention these days, and I think that’s a great thing! It deserves it. I have a few things to add. To reiterate what you said above, shag over the past 10+ years has slowly progressed away from the predominantly imitative and choreographed form it had in 1999 to a state where lead-follow technique and musicality are key. And I think you are right that moving the dance forward partly involves asking ourselves whether it’s ok to borrow from other dances and whether we are doing shag a disservice when we do this. I’m interested to see what direction it takes in the coming years. I personally don’t think there’s any need to borrow yet. There’s still a great deal to be explored within the shag form itself. Perhaps, it’s just easier to borrow moves, so we tend to look in that direction first. First, I think the word “polyrhythm” has two different senses when we’re talking about shag. Second, I think the term “polyrhythm” itself is often misused (unintentionally, of course), and this thread is probably as good a place as any to hash out the distinctions. After many interviews and discussions, it’s my understanding that, amongst the four shag rhythms (single, double, triple, and long-double), polyrhythms only happen in double shag. That is, to dance polyrhythmically means that the rhythm that one is dancing does not have the same iteration of beats/counts as the rhythm of the music, but the two rhythms meet up regularly in intervals. So, for example, double-rhythm shag is a six count dance, but swing music is typically laid out with four beats per measure. Hence, the first count of the shag basic, and the first beat of a measure in the music will only line up every three measures. …said in reverse, the first count in the double shag basic will meet up with the first beat of a measure every two basics. This does not happen with eight and four-count dances. And the other three shag rhythms are all eight-count dances. So, their rhythms match the four-beats-per-measure quite nicely. For some, this means being musical is more difficult in double shag. For others, this quality is what makes double shag so fantastic–a completely new world of musical possibilities. This polyrhythmic characteristic in double-shag has an aesthetic (or kinesthetic) effect that’s kind of hard to describe, and this is, I believe, the reason some people love it so much – whether they understand all this technical talk or not. One dance historian-type I interviewed told me the effect of polyrhythms in shag (or any dance) is like getting pulled away from the rhythm only to return to it a moment later – which gives the dancer a feeling of resolution. This reminded me of the climactic rise and fall we experience while listening to classical music. For me, polyrhythms in shag have a strangely pleasant elliptical feel …if that makes any sense. Now, there’s another (equally legitimate) sense in which folks use the term “polyrhythm” in shag, and it’s very closely related with the sense I just outlined. This is probably the sense that most people mean when they say they are “dancing polyrhythms” in shag. That is, advanced shag dancers will sometimes either alter their double shag footwork or add in some four-count moves (not to be confused with switching the basic) in order to hit accents in a measure or phrase. For example, some will slightly alter their steps so that a kick or a stomp will accent the 5th or 3rd count in their basic. By doing this they manage to keep their six-count basic while simultaneously hitting the accented measures in the music. They also often times do things like add two sets of four-count breaks or a set of double-doubles (or any move that has the same eight-count effect) to hit something at a certain point in the phrasing of the song (usually toward the end of the phrase). In either case, they still keep their six-count basic; they only add things to it in order to play with the music. It’s been my observation that a lot of folks do this stuff without realizing they’re being “polyrhythmic”. They just do it ’cause it feels good. And if double-shag remains the dominant shag form, I think this may be a big, though under-appreciated, reason why. Finally, the term “polyrhythm” has become such a buzz word in the shag community lately that it’s not surprising it gets misused. It seems to me that when folks misuse the term, what they usually mean is something more like ‘multi-rhythm’. But, I don’t think “multi-rhythm” is really a bonified term in music or dance theory, so take what I say here with a grain of salt. If we treat this term (multi-rhythm) seriously, I would say that to dance in multi-rhythms would be to dance the same dance, but switch rhythms (i.e., “switch basics” as people say) throughout the song. Tony Fraser seems to be a big fan of this type of dancing. And it occurs to me it must be very difficult. Hey thanks for the reply and no worries about it being long, I tend to enjoy comments that are thought out. Also i’m actually going to slightly edit and put a note in the post to look at your comment, because what I was referencing to was what you described as “multi-rhythms”. Right on! Thanks again, man. I really enjoy your blog.